(Nanowerk News) Toothaches and root canals loom large in the collective memory and the whine of a dentist’s drill conjures unpleasant memories for most. Tooth decay and cavities most commonly affect the enamel that protects a tooth’s exterior. Though it’s been known for decades that various trace ions are important for tooth enamel’s tough structure, it had been impossible to map their distribution in meaningful detail. We solved this long-standing problem using atom probe tomography, a powerful atomic-scale microscopy and micro-analysis technique. It allowed us to make out the enamel’s nanoscale composition and structure. Our research ("Amorphous intergranular phases control the properties of rodent tooth enamel") identified never-before-seen amorphous biominerals and how they contribute to both mechanical hardness and the resistance of enamel to acid dissolution. Understanding more about the mechanism of how teeth decay will hopefully lead to innovations in its prevention and treatment. As one of the most common chronic diseases, dental caries – also known as tooth decay – is an important public health problem. A staggering 60-90% of children and nearly 100% of adults worldwide have or have had cavities. If left untreated, caries can lead to severe pain, loss of the affected tooth, systemic infection and even death. Caries affects sufferers physically and psychologically, too, since it can influence how children develop, how we perceive ourselves and others, how we eat, speak, smile and socialize. A significant portion of the US$110 billion dental expenditure in the US alone is due to caries. Caries results from an imbalance between the naturally occurring processes in our mouths that degrade and dissolve enamel, and those that restore it. When we consume food or drink, plaque bacteria on our teeth take up sugars and produce acids. These acids lower pH in the mouth and dissolve enamel, which consists primarily of the mineral hydroxylapatite. Unlike most tissues in our bodies, once enamel is made, it’s not repaired by cells. Luckily, our saliva will return the pH to normal values within a short period of time, usually less than an hour. It also contains the chemical ingredients of hydroxylapatite: calcium, phosphate, and hydroxide ions. As the teeth are constantly bathed in these building blocks, the enamel is regenerated when the mouth is at normal pH. But there are many factors – including foods high in certain sugars, poor dental hygiene, certain medical conditions – that can shift the balance towards net loss of tooth biomineral. This leads to caries and the development of cavities. Since the introduction of drinking water fluoridation, little has changed in the way dentists detect and treat caries. Enamel has a very complex structure that’s hindered innovation. For example, even though we’ve known magnesium, carbonate and fluoride ions influence enamel properties, we hadn’t been able to map their location in enamel at a high enough resolution. We don’t have good quantitative models of how enamel changes over time as caries develops. Innovation in prevention, early detection, and treatment by dentists have all been stymied. Enamel is made up of slender rods packed together in layers, as shown above. The rods – each smaller in diameter than a red blood cell – are woven together as in a basket. In between these rods is what’s called the inter-rod enamel. Each rod is made up of about 10,000 tiny hydroxylapaptite crystals that lie side-by-side like a bunch of uncooked spaghetti. Of course in enamel the crystals don’t rattle around like spaghetti in a box; they’re stuck together, the way spaghetti clumps when you boil it in not enough water. The areas where neighboring crystals stick to each other are called grain boundaries. We knew from exposing polished enamel to an acid bath that the sides of the crystals – the grain boundaries – dissolved much more rapidly than the ends. 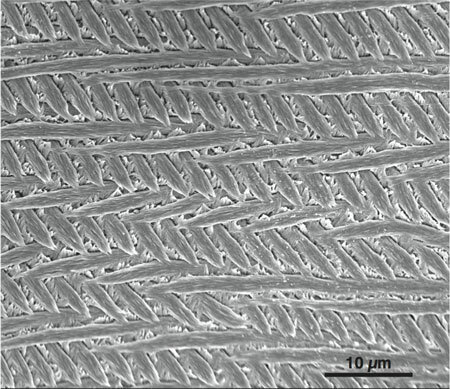 The resulting structure looks like a forest of nanowires, as shown above on the right. Researchers had suspected this had to do with the presence of magnesium and other ions at the grain boundaries. But it had been impossible to prove why the grain boundaries were more vulnerable to acid than the ends of the crystals. We turned to atom probe tomography (APT) to answer the question. Atom probe uses ultraviolet laser pulses to evaporate single atoms or small clusters from the surface of the material one wants to analyze, and a very high electric field that strips electrons from the evaporated atoms and creates ions. Then the ions are projected onto a position-sensitive detector and their mass-to-charge ratio is determined by their time-of-flight. Using atom probe, we can make distinctions that are as small as a fraction of a nanometer – very tiny, considering a human hair is about 100,000 times wider than that. By picking apart enamel specimens atom-by-atom and layer-by-layer, we were able to build a 3-D map of millions of different atoms in small pieces of rat and mouse enamel (commonly used as model systems for human enamel). Best of all, we can see where all the different ions – for example, magnesium or fluoride – are in the enamel’s structure. We found that in mouse enamel, the magnesium ions are almost all at the grain boundaries, or ‘between the spaghetti.’ We also discovered that there are special grain boundaries where three or more crystals meet that have an even higher magnesium concentration. We were surprised to see that the environment around the magnesium ions is not ordered as in a crystal. This finding is evidence that there’s a different kind of material or ‘phase’ in between the crystalline nanowires, gluing them together. We call it magnesium-rich amorphous calcium phosphate (Mg-ACP). What properties of enamel would depend on this amorphous glue? From our initial experiments it looked like the Mg-ACP dissolved much more rapidly in acid, which is not a good thing because it weakens enamel. Rats, beavers and other rodents also have a different kind of enamel, called pigmented enamel. It’s a thin, iron-rich layer that’s harder than regular enamel. Rather than Mg-ACP, we found that the material at the grain boundaries in the pigmented enamel consists of the mineral ferrihydrite and amorphous iron-calcium phosphate (Fe-ACP). There is practically no magnesium at all. When we exposed pigmented enamel to acid, we found that its grain boundaries did not dissolve at all! Over time, pigmented enamel dissolved much more slowly than regular enamel, and even more slowly than enamel treated with fluoride. In fact, since the magnesium-rich glue dissolves much more readily than the iron-rich one, we suspect it is the Achilles heel of rodent enamel. On the other hand, the magnesium-rich material likely acts as conduit for fluoride diffusion into the tooth, and may thus contribute to its protective effects. Now that we know the amorphous glue between the enamel rods is so important, we need to confirm whether it also occurs in human enamel. We also want to understand how enamel and the amorphous phase changes over time in healthy teeth and in teeth with tooth decay. Next, researchers can look for strategies to harden enamel against acid corrosion – perhaps using the tougher iron-rich enamel in rodents as a blueprint. The ultimate goal is to find new ways to prevent and detect caries, and to develop minimally invasive treatments to replace current “drill and fill” management of tooth decay.